Need a little pick-me-up today? Check out the Big Clapper, a robot designed to, you guessed it, clap. 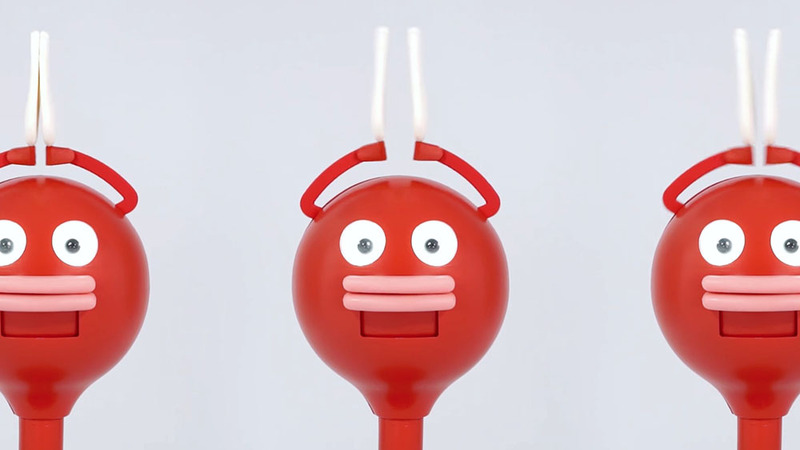 If you like the idea of a roughly three-foot tall, red tomato with hands encouraging you through your daily tasks, you can donate to the kickstarter and have one of your very own! The Big Clapper is designed by Masato Takahashi, president of Bye Bye World Inc, an entertainment-oriented product company. Takahashi wanted to create technology that would entertain people and lift their spirits. He wanted to delight people all over the world. If you check out his kickstarter page for Big Clapper, you can read all about the process from initial concept to freaky prototypes and finally, to the Big Clapper. There are several real life applications of this little applauding robot. It is possible that it will appeal mostly to businesses and retail stores who want to attract attention. It could also help people who suffer from low self-esteem or need positive reinforcement in their daily lives. Though, if it does take off, you’ll probably find it mostly greeting people at stores, attracting visitors at exhibitions and maybe even at a sports event or two. Big Clapper weighs in at roughly 16 pounds. Its sensors have a five meter radius and it connects to wifi (so you can sync it with your apps). There are a variety of apps available that work with the Big Clapper. To what purpose, though, is something you’ll have to find out. The body is made of ABS, aluminum and stainless steel; while the hands free urethane resin & aluminum. The sound it makes is very much like a clap, but if someone were slapping their hands together, rather than hitting them. A very enthusiastic, slightly wet sounding clap. A freelance writer and editor, Lisa Hoekstra loves learning and trying new things. She can be found with her nose in a book or multiple tabs open on her browser as she researches the latest and greatest in the world of food, style and everything in between.